Canada’s Double Portion from North Battleford, SK is a unique group in many ways. 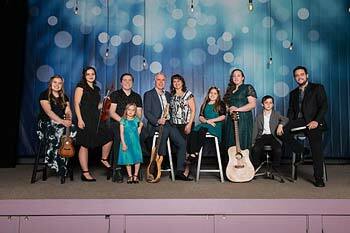 This 5 piece Gospel band is made up of entirely one family including parents Duncan & Debbie Hemmerling and 8 of their 10 children. Juggling homework and musical instruments is a daily routine for the Hemmerling children. They trade in riding the school bus for riding across the country in Canada’s Double Portion tour bus for almost half the year.